earBOOKS is based out of Germany and they combine sophisticated coffee table books with music, thus giving enthusiasts something special. Their latest release, “Movies: Sound! Camera! Action!” is exactly what the title implies. 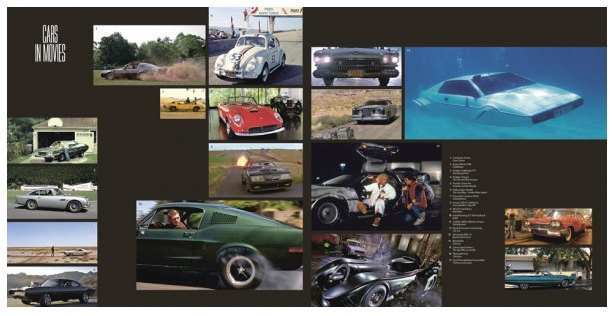 This gorgeous, over-sized hardcover has 220 pages packed with over 400 incredible color and black and white photos from some of cinemas best movies. To accompany these amazing photos are 8 cd’s containing the memorable music from the films that have left their mark on the silver screen. Try to imagine Once Upon A Time In The West without its harmonica leitmotif, or the shower scene from Psycho without the shrill staccato strings – not the same movies at all, are they? Images and music are inextricably linked in cinema. 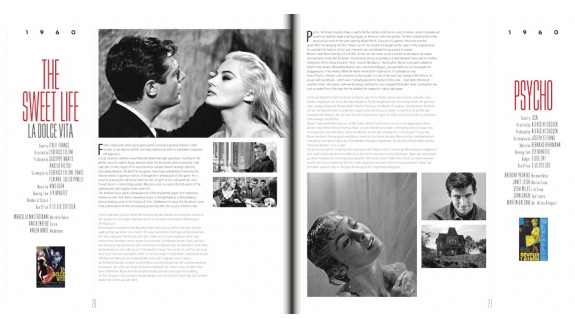 This compendium therefore not only presents magnificent film stills, stories and facts, it also provides handpicked music themes from every film featured. The journey takes us in chronological order from the black and white slapstick of the 1920s to the Golden Age of Hollywood. From the opulence of monumental cinema to film noir. From the variety of New Hollywood to the first blockbusters and phenomenal franchises to the latest big budget productions. Peplum films and Spaghetti Westerns, gangster epics and grand dramas, action smashes and science fiction sagas, this rich mix of genres brings together legendary films from almost 100 years, honoring popcorn cinema and the independents alike. Star directors, silver screen heroes and the artists behind the camera who have written movie history. And, of course, those who have written the music to accompany the pictures we see. Looking at the titles within you can see the diversity and the brilliance of each film along with the score that accompanied it. Films like Casabalanca, The Bridge Over the River Kwai, Psycho, The Good the Bad and the Ugly, 2001: A Space Odyssey, Rocky, Star Wars, Blade Runner, The Nightmare Before Christmas, Toy Story, The Matrix and all the others that are included, once you hear the music, you are instantly teleported back to the film, your favorite scenes, characters, and even bad guys. 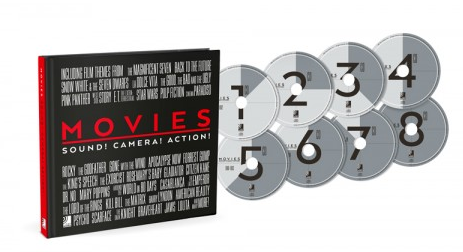 This book is an absolute must-have for any film/ music enthusiast. 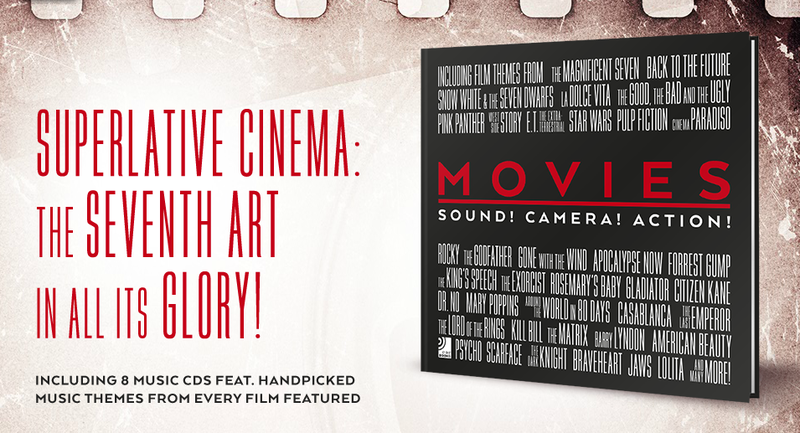 CLICK HERE to order your copy of Movies: Sound! Camera! Action! and get caught up in the power of music. Then head over to earBOOKS OFFICIAL WEBSITE to see the rest of their amazing catalog. This entry was posted in Books, Movies, Music and tagged amazing photos, Book, cinema, earBOOKS, film, hardcover, memorable music, movies, Movies: Sound! Camera! Action!, soundtracks. Bookmark the permalink.